The American Film Institute in Los Angeles conducted their sixth polling, 100 Heroes and Villains. AFI again celebrated American cinema, and revealed America’s 100 greatest good and bad guys/gals (50 of each), either fact-based or fantastically-fictional, as chosen by voters - a jury of 1,500 directors, actors, screenwriters, critics, historians and others. [Compare to the list of The Online Film Critics Society (OFCS) that in 2002 had polled their own membership of Internet-based cinema journalists for the top 100 greatest screen villains of all time, accessible here.] The list of 400 nominated films was made available before the final voting. The AFI left the judgment calls to jurors about the categorization of virtuous heroes and wicked villains, advising them only to not vote for a character as both. Hero - Sometimes mythic figures, sometimes ordinary people who prevail in extreme circumstances, heroes dramatize a sense of morality, courage and purpose often lacking in our everyday world. Heroes do what is good, just and right; and even though they may be ambiguous or flawed characters, they often sacrifice themselves to show humanity at its best and most humane. For voting purposes, AFI defined a "hero" as a single character, a duo or a team of characters. Villain - Characters that movie goers love to hate - and hate to love. Villains are characters whose wickedness of mind, selfishness of character and will to power are sometimes masked by beauty and nobility. Others rage unmasked. Daring the worst to gain the most, the movie villains we remember best can be horrifically evil, merely sleazy or grandiosely funny, but are usually complex, moving and tragic. 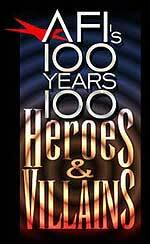 For voting purposes, AFI defined a "villain" as a single character, a duo or a team of characters. Cultural Impact - Characters that have made a mark on American society in matters of style and substance. Legacy - Characters that elicit strong reactions across time, enriching America's film heritage and inspiring artists and audiences today. Feature Length Feature Films - Only feature-length American films released before January 1, 2002 were considered. AFI defined a feature-length film as a motion picture of narrative format that is typically over 60 minutes in length. AFI defined an American film as an English language film with significant creative and/or financial production elements from the United States.